According to World Health Organization, in 2016, nearly 2 billion adults worldwide were overweight and, of these, more than half a billion were obese . Obesity is associated with multiple health consequences, including prostate cancer (PCa) . In many developed countries such as United States, prostate cancer is the third leading cause of death in men. It has been estimated that in 2018, there will be 161,360 new cases of prostate cancer and approximately 26,730 people will die of this disease . Its incidence is increasing in developing countries as well. A rapid increase over the past 20-30 years has been found in Asian men as well, probably due to change in dietary habits, obesity and western sedentary lifestyle . Adipobiology is a study of endocrine, paracrine and autocrine activities of adipose tissue. Hence, adipoparacrinology is the study of paracrine secretory activities of adipose tissue. It is a new emerging topic in research field . Adipose tissue is of two types; white adipose tissue (WAT) and brown adipose tissue (BAT). Recently, WAT has been recognized not only as an energy storage but also as the body’s major endocrine and paracrine organ . WAT is divided mainly into two large depots; subcutaneous and visceral. Visceral depots constitutes of organ associated adipose tissues like epicardial and periadventitial adipose tissue in atherogenesis, mammary gland-associated adipose tissue in breast cancer, mesenteric adipose tissue in Crohn’s disease etc . Recently, studies on paracrine activities of organ associated adipose tissues demonstrated periprostatic adipose tissue (PPAT) as a source of adipokines like adiponectin, resistin, leptin, and adipsin, and a source of a variety of other cytokines, such as tumor necrosis factor and interleukin-6 (IL-6) which forms a key component in the tumor microenvironment [7-14]. Several in vivo and in vitro studies have suggested a potential role of periprostatic adipose tissue in the development and progression of PCa [15-17]. This review highlights the relationship between periprostatic adipose tissue, adipokines and prostate cancer. We reviewed all the clinical studies published till date that have demonstrated PPAT as a risk factor for prostate cancer diagnosis and progression. Until recently, external adipose tissue has been considered the predictive indicator of obesity and BMI as the anthropometric measure of obesity. Several studies have shown the inconsistent relation between Body Mass Index (BMI) and Prostate Carcinoma (PCa) [18-23]. Hence, researchers now have shifted their focus on more specific body fat distribution like visceral fat, as it is more active metabolically than subcutaneous fat and produces adipokines, cytokines, tumor necrosis factor, interleukin-6, and adiponectin. They have even considered regional adipose tissue, such as periprostatic fat as an area of interest and taken into account its potential role in the development and progression of PCa. Woo et al. , conducted a retrospective study on patients who underwent MRI before radical prostatectomy to evaluate the relation between periprostatic fat thickness (PPFTh) and Gleason score (GS). They used the shortest perpendicular distance from pubic symphysis to prostate [Figure1- red line]. 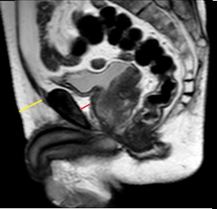 Figure 1: A retrospective study on patients who underwent MRI before radical prostatectomy to evaluate the relation between periprostatic fat thickness (PPFTh) and Gleason score (GS); Red line-shortest perpendicular distance from pubic symphysis to prostate. Higher periprostatic fat density had an increased risk of aggressive prostate cancer. No association between elevated PPAT and increased risk of aggressive PCa. And for patients with PI-RADS grade 3. Table 1: Periprostatic fat mapping methods in previous studies and their outcomes. They also measured age, height, weight, BMI, PSA to correlate with Gleason score. This study reported a significant correlation of PPFTh with GS and was able to differentiate GS-7 from GS-6. However, BMI and subcutaneous fat thickness were not correlated with GS. Zhang et al. in 2013 , also showed that periprostatic adiposity measured on a single transverse MRI section aids in accurate assessment of stage and grading of PCa. They measured periprostatic fat area including ischiorectal fossae measurements [Figure 2]. Figure 2: Periprostatic fat area including ischiorectal fossae measurements. Zhang and colleagues  from China also performed another similar study using MRI to investigate the correlation of periprostatic fat and PCa aggressiveness and also the role of adipocytokines in stimulating the progression of prostate cancer from lower to higher grades. They were able to justify that the levels of IL-6, leptin and C-reactive protein (CRP) significantly increased with the aggressiveness of prostate cancer and also with periprostatic fat and the ratio of visceral fat. The ratio of visceral fat is defined as the anterior (AAT) plus posterior abdominal fat thickness (PAT) subtracted from the anteroposterior diameter (APD) divided by the anteroposterior diameter and expressed as a percentage [25,26]. The strongest correlation was seen between IL-6 and PPAT. One study in 2016 by Tan et al. , used reconstructed MRI images to investigate not only periprostatic fat thickness but also periprostatic fat volume and periprostatic fat ratio. This study did not use histopathology of radical prostectomy as a reference standard and thus has limitations. Previously, studies using MRI were much less. Nowadays, the routine use of MRI in the diagnosis of prostate carcinoma has yielded a more accurate volume of prostate fat. This study has further suggested that periprostatic fat ratio is a better predictor of high grade prostate cancer and has the potential to aid in the decision to biopsy process compared to periprostatic volume. A very recent study published by Dahran et al. on July 2017 , is a first prospective study that measured periprostatic and pelvic fat volume with normalization to prostate gland volume on MRI (T1-weighted images) and demonstrated significantly strong correlation with GS and PCa. They reported that measuring periprostatic fat volume from prostate base to apex might be time consuming but is most accurate and appropriate, as prostate tumour and cancer-related adipocytes can be located at any level in the gland. The other rationale is that body fat distribution varies between individuals according to age, angiogenesis, adipogenesis, genetic regulation and insulin resistance. Cao et al. evaluated periprostatic adipose thickness as a supportive marker in predicting the presence of prostate cancer. Their main aim was to demonstrate that PPFTh may have a pre-biopsy clinical utility to improve the diagnostic abilities of MRI and PI-RADS version 2. Although, the specificity and sensitivity of MRI in the diagnosis of prostate cancer is 88% and 74% as calculated by Rooij M et al. . However, there are certain limitations that MRI and PI-RADS encompasses, among which the inability to accurately determine PIRADS- 3 lesion remains a recognized drawback. This study has provided a strong support in the diagnosis of indeterminate lesions of the PI-RADS grade 3 subgroup. They not only demonstrated that age, %fPSA and PPFT were independent predictors of PCa and High Grade PCa (HGPCa) but also suggested that PPFTh is an independent predictor of prostate carcinoma, especially in PIRADS grade 3 subgroup. A millimeter increase in PPFT was associated with 156% increased odds of detecting prostate cancer and 170% increased odds of HGPCa. Another recent study on 2017 by Salji et al. , used MRI to test if periprostatic fat volume (PPFV) predicts tumor response following androgen deprivation therapy(ADT). They retrospectively collected data of patients with locally advanced or metastatic PCa treated with primary ADT. Periprostatic fat volume was delineated from apex to base. This study suggested that PPFV measurement can be considered a useful biomarker of CRPC as PPFV was significantly higher in patients who developed Castration resistant advanced prostate cancer. The advantage of using MRI is it is free of ionizing radiation and is reliable. It can routinely be used for diagnosis of prostate cancer and accurate visceral fat mapping without need of any dedicated software. It not only helps to evaluate the local extent of disease but the possibility of nodal involvement for clinical staging can also be easily assessed. It is feasible in a clinical setting and provides superior soft tissue contrast and resolution, quantitative reconstruction techniques, and physiologically-based threshold, all of which are required for accurate adipose tissue measurements. A pre-biopsy MRI helps to select appropriate candidates for biopsy and thus avoid unnecessary invasive techniques. MRI allows rapid and accurate mapping of visceral fat independent of operator intervention [32-33]. Researchers have also used Magnetic Resonance Spectroscopy (MRS) to study the role and effects of periprostatic fatty acid composition and its correlation with pathological markers (Gleason Score and extracapsular extension) of prostate cancer aggressiveness. A study suggests that periprostatic fatty acid composition and metabolism alters in aggressive PCa . Similarly, another study done in Argentina in 2015, determined fatty acid composition in PPAT of PCa and BPH patients. The differences in fatty acid content of PPAT in PCa and BPH is a new way to find the relation between PPAT and PCa aggressiveness . A pilot study performed in 2013, analysed the functional aspects of periprostatic adipose tissue secretions by histology, MRI and MRS technologies in lean, overweight and obese PCa patients. MR spectroscopy demonstrated the periprostatic fatty acid composition differs from subcutaneous adipose tissue in obese PCa patients. They further successfully demonstrated that PPAT stimulates PCa cell proliferation and angiogenesis and that obesity intensifies this activity . Different researchers have used different non-invasive approaches such as ultrasonography, computed tomography, magnetic resonance Imaging and magnetic resonance spectroscopy, with modern softwares to quantify visceral fat and improve organ-associated fat mapping technique. Bhindi et al. performed this study using transrectal ultrasonography (TRUS) in patients without prior diagnosis of PCa and revealed that PPFTh has positive association with PCa and PPFTh can be estimated with TRUS as well. Although, TRUS is mainly operator dependent and pressure applied during the process may alter the measurement of PPAT. But it can be used in situations when biopsy is associated with severe complications. Meanwhile, Roermund et al. in 2009 , concluded that periprostatic fat and fat-density measured with CT were not correlated with PC aggressiveness in patients receiving brachytherapy. However, similar study performed in 2010 by the same researchers , reported patients with a higher periprostatic fat density had more aggressive prostate cancer. This discrepancy in the results was attributed to different approaches in mapping the periprostatic fat and different population size. Allott et al. , conducted a cross-sectional analysis between black and non-black men with 308 radiation treated patients. They examined obesity parameters like BMI, waist circumference, visceral fat area and periprostatic adipose tissue area and its association with PCa aggressiveness on CT scan. The results showed black men had significantly less PPAT relative to non-black men but no association between elevated PPAT and increased risk of aggressive PCa were found. Although studies using CT has high risk of exposure to ionizing radiation and also CT is not often used in patients with prostate cancer. However, it is an exceptional modality to assess and accurately quantify subcutaneous and visceral fat. Attenuation coefficient of adipose tissue can be readily used to delineate accurately between surrounding soft tissues, air and designated adipose tissue. No matter which modality is used to measure the periprostatic adipose tissue, each has its own advantages and disadvantages. Use of diverse techniques, imaging modalities and methods to quantify periprostatic fat with variable reference standards and comparative measures with limitations of each research designs may have influenced the different outcomes of these studies. To best of our knowledge, only two review articles till date have been published on this topic by Hollander et al. and Toren et al. . Research using MRI had not been published in 2013 and 2014, so they have illustrated only three studies that used imaging techniques like TRUS and CT in evaluating the correlation between PPFTh and PCa. Only 7 studies using MRI, 3 studies using CT and one study using TRUS have been performed to date which has been included in this review. White adipose tissue is composed mostly of adipocytes along with stromal vascular cells like and immune cells such as macrophages, lymphocytes and mast cells . Several bioactive molecules and cell signaling proteins like cytokines, growth factors and hormones jointly termed as adipokines are secreted by adipose tissue. The paracrine activity of adipokines and the endocrine derangements such as increased serum estrogen, insulin, IGF-1 and its cancerogenic effect on the prostate gland is hypothesized to be the basis of correlation between PPAT and PCa in several studies. Sacca et al. , evaluated the role of periprostatic adipose tissue (PPAT) from patients with Benign Prostate Hyperplaisa (BPH) and compared with PPAT from PCa patients. Their study provided the first evidence that PPAT releases pro-MMP-9, and that PPAT-conditioned media from patients with PCa shows higher activity of pro-MMP-9 than PPAT conditioned media from patients with BPH. This study signifies that the factors released from adipose tissue of PCa can induce disease progression. More than one-third IL-6 circulating in bloodstream are secreted by adipocytes[44,45]. In vitro studies revealed that both the autocrine and paracrine activities of IL-6 is known to stimulate the growth of human prostate cancer cell lines that leads to hyperplasia of tumor cells [9,12,46]. It regulates variety of cellular functions including proliferation, apoptosis, angiogenesis, and differentiation . Finley et al. were the first to study adipokine levels in PPAT. In their study, they harvested PPAT from patients undergoing Radical prostectomy (RP), and demonstrated that IL-6 in PPAT-conditioned medium was approximately 375 times greater than in patient matched serum. This finding suggests that periprostatic adipose tissue could be regarded as a source of pro-cancerogenic adipokines. This study also suggested the idea of bidirectional interaction of IL-6 between PPAT and prostate tumors. Serum IL-6 levels >7 pg/ml shows poor prognosis in men with prostate cancer and increased levels of IL-6 in localized tumours suggests IL-6 acitivity in the early stages of prostate carcinogenesis [11-12]. Leptin is a peptide hormone that regulates energy homeostatis, metabolism and neuroendocrine function. Serum level of leptin in lean individuals is on average 4 ng/ml, whereas obese people show much higher levels around 40 ng/ml . Numerous studies have investigated the relation between leptin and prostate cancer [48-50]. Chang et al. showed that elevated leptin was found in men with aggressive disease. Another study by SK Singh et al. shows that prostate cancer is associated with raised serum leptin. In vitro studies showed that leptin promotes proliferation of androgen-independent PCa and induces cell migration and expression of growth factors in PCa cells [51-52]. Saglam et al. also showed that the high leptin influence the progression of a latent PCa to a high grade PCa. Several in vitro and in vivo studies demonstrated that leptin promotes angiogenesis and can aid in the enlargement and metastasis of several neoplasias including PCa [15-17]. Vascular endothelial growth factor(VEGF) are important signaling proteins involved in angiogenesis. Tumors induce angiogenesis by secreting VEGF and increasing the number of capillaries which supply nutrients to the tumor for its expansion and progression to aggressive form . Many researches have demonstrated that in the presence of VEGF, endothelial cells will proliferate and migrate forming capillaries [55-57]. Fernando et al. studied the invivo and invitro expression of angiogenesis which demonstrated that significant levels of VEGF are present in PCa, but not in BPH or normal prostate cells in vivo. Only few clinical studies to estimate periprostatic adipose tissue parameters (thickness, area, volume, density, ratio, fatty acid composition) have been published. These studies suggest the potential of periprostatic adipose tissue mapping in preoperative assessment of Gleason score and in evaluating PI-RADS grade 3 subgroup lesions. The increasing mortality of men due to prostate cancer demands a new, accurate and reliable predictor for this disease and the convenience in measuring PPF without the need of expertise and invasiveness makes it a more practical and feasible clinical parameter in the prediction of prostate carcinoma. The study of adipoparacrinology and mapping of periprostatic fat provides an auxiliary role in the future diagnosis of prostate carcinoma. Hence, more research regarding this topic is suggested. This is to inform you that this review article do not involve the use of human subjects or experiments involving humans and animals. No harm has been done to animals and humans or provided any drugs, or caused any physical, mental or social harm. There are no competing interests regarding this review article. This is to ensure that this review article has not been published previously. The Young and Middle-aged Technical Academic Leaders Training Project in Yunnan province (Grant No. 2015HB068). The Yunnan Province Medical Subject Leaders Training Project (Grant No. D-201646). Freedland, Stephen J, William J Aronson. Examining the Relationship Between Obesity and Prostate Cancer. Reviews in Urology 2 (2004): 73-81. Rebecca L Siegel, Kimberly D Miller, Ahmedin Jemal. Cancer statistics 2017. Pu YS, Chiang HS, Lin CC, et al. Changing trends of prostate cancer in Asia. Aging Male 7 (2004): 120-132. George N Chaldakov, Nee Tunçel, Jerzy Beltowski, et al. Adipoparacrinology: An Emerging Field in Biomedical Research. Nikolai Evtimov, Alexander I Hinev, Deyan Anakievski, et al. Adipoparacrinology: Periprostatic Adipose Tissue as an Example. Sacca PA, Creydt VP, Choi H, et al. Human periprostatic adipose tissue: its influence on prostate cancer cells. Cell Physiol Biochem 30 (2012): 113-122. Okamoto M, Lee C, Oyasu R. Interleukin-6 as a paracrine and autocrine growth factor in human prostatic carcinoma cells in vitro. Cancer Res 57 (1997): 141-146. Culig Z, Steiner H, Bartsch G, et al. Interleukin-6 regulation of prostate cancer cell growth. J Cell Biochem 95 (2005): 497-505. Nakashima J, Tachibana M, Horiguchi Y, et al. Serum interleukin 6 as a prognostic factor in patients with prostate cancer. Clin Cancer Res 6 (2000): 2702-2706. Giri D, Ozen M, Ittmann M. Interleukin-6 is an autocrine growth factor in human prostate cancer. Am J Pathol 159 (2001): 2159-2165. Chang S, Hursting SD, Contois JH, et al. Leptin and prostate cancer. Prostate 46 (2001): 62-67. Singh SK, Grifson JJ, Mavuduru RS, et al. Serum leptin: A marker of prostate cancer irrespective of obesity. Cancer Biomark 7 (2010): 11-15. Baillargeon J, Platz EA, Rose DP, et al. Obesity, adipokines, and prostate cancer in a prospective population-based study. Cancer Epidemiol Biomarkers Prev 15 (2006): 1331-1335. Hsing AW, Sakoda LC, Chua S Jr. Obesity, metabolic syndrome, and prostate cancer. Am J Clin Nutr 86 (2007): 843-857. West DW, Slattery ML, Robison LM, et al. Adult dietary intake and prostate cancer risk in Utah: A case-control study with special emphasis on aggressive tumors. Cancer Causes Control 2 (1991): 85-94. Law EA, Garfinkel L. Variations in mortality by weight among 750,000 men and women. J. Chronic Dis 32 (1979): 563-576. Snowdon DA, Phillips RL, Choi W Diet. Obesity, risk of fatal prostate cancer. Am J Epidemiol 120 (1984): 244-250. Freedland SJ, Terris MK, Platz EA, et al. Body mass index as a predictor of prostate cancer: Development versus detection on biopsy. Urology 66 (2005): 108-113. Whittemore AS, Paffenbarger RS, Jr Anderson K, et al. Early precursors of site-specific cancers in college men and women. I Nail Cancer Inst (Bethesda) 74 (1985): 43-51. Eugenia E Calle, Carmen Rodriguez, Kimberly Walker-Thurmond, et al. Overweight, Obesity, and Mortality from Cancer in a Prospectively Studied Cohort of U.S. Adults. N Engl J Med 348 (2003): 1625-1638. Carmen Rodriguez, Stephen J Freedland, Anusila Deka, et al. Body Mass Index, Weight Change, and Risk of Prostate Cancer in the Cancer Prevention Study II Nutrition Cohort. Cancer Epidemiol Biomarkers Prev January 16 (2007): 63-69. Sungmin Woo, Jeong Yeon Cho, Sang Youn Kim, et al. 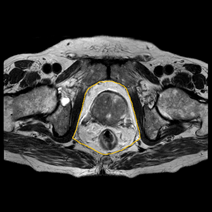 Periprostatic Fat Thickness on MRI: Correlation With Gleason Score in Prostate Cancer. American Journal of Roentgenology 204 (2015): 43-47. Zhang Qiang, Sun Li-jiang, Qi Jun, et al. Periprostatic Adiposity Measured on Magnetic Resonance Imaging Correlates with Prostate Cancer Aggressiveness. Urol J 11 (2014): 1793-1799. Qiang Zhang, Li-Jiang Sun, Jun Qi, et al. Influence of Adipocytokines and Periprostatic Adiposity Measurement Parameters on Prostate Cancer Aggressiveness. Asian Pac J Cancer Prev. 15 (2014): 1879-1883. Wei Phin Tan, Carol Lin, Meri Chen, et al. Deane, Periprostatic Fat: A Risk Factor for Prostate Cancer?. In Urology 98 (2016): 107-112. Naief Dahran, Magdalena Szewczyk-Bieda, Cheng Wei, et al. Normalized periprostatic fat MRI measurements can predict prostate cancer aggressiveness in men undergoing radical prostatectomy for clinically localised disease. Sci Rep 7 (2017): 4630. Yudong Cao, Min Cao, Yuke Chen, et al. The combination of prostate imaging reporting and data system version 2 (PI-RADS v2) and periprostatic fat thickness on multiparametric MRI to predict the presence of prostate cancer. Oncotarget 8 (2017): 44040-44049. Maarten de Rooij, Esther HJ Hamoen, Jurgen J Fütterer, et al. Rovers. Accuracy of Multiparametric MRI for Prostate Cancer Detection: A Meta-Analysis. American Journal of Roentgenology 202 (2014): 343-351. Salji, Mark, Jane Hendry, et al. Peri-prostatic Fat Volume Measurement as a Predictive Tool for Castration Resistance in Advanced Prostate Cancer (2017). Siegel R, Naishadham D, Jemal A. Cancer statistics, 2013. CA Cancer J Clin 63 (2013): 11-30. Poonawalla AH, Sjoberg BP, Rehm JL, et al. Adipose tissue MRI for quantitative measurement of central obesity. JMagn Reson Imaging 37 (2013): 707-716. Lordanescu G, Brendler C, Crawford S, et al. MRS measured fatty acid composition of periprostatic adipose tissue correlates with pathological measures of prostate cancer aggressiveness. J Magn Reson Imaging 42 (2015): 651-657. Valeria P Careaga, Paula A Sacca, Osvaldo N Mazza, et al. Fatty Acid Composition of Human Periprostatic Adipose Tissue from Argentine Patients and Its Relationship to Prostate Cancer and Benign Prostatic Hyperplasia. Research In Cancer and Tumor 4 (2015): 1-6. Venkatasubramanian PN, Brendler CB, Plunkett BA, et al. Periprostatic adipose tissue from obese prostate cancer patients promotes tumor and endothelial cell proliferation: a functional and MR imaging pilot study. Prostate 74 (2014): 326-335. Bimal Bhindi, Greg Trottier, Malik Elharram, et al. Measurement of peri-prostatic fat thickness using transrectal ultrasonography (TRUS): A new risk factor for prostate cancer. BJUI Int 110 (2012): 980-986. Joep GH van Roermund, Gijsbert H Bol, Alfred Witjes J, et al. Periprostatic fat measured on computed tomography as a marker for prostate cancer aggressiveness. World J Urol 28 (2009): 699. Allott EH, Howard LE, Song H-J, et al. Racial differences in adipose tissue distribution and risk of aggressive prostate cancer among men undergoing radiation therapy. 23 (2014): 2404-2412. Philip P Den Hollander, Kevin LJ Rademakers, Joep GH van Roermund. Is periprostatic adipose tissue associated with aggressive tumor biology in prostate cancer?. World J Clin Urol 3 (2014): 320-324. Toren P, Venkateswaran V. Periprostatic adipose tissue and prostate cancer progression: new insights into the tumor microenvironment. Clin Genitourin Cancer 12 (2014): 21-26. Matsuzawa Y, Funahashi T, Nakamura T. Molecular mechanism of metabolic syndrome X: Contribution of adipocytokines adipocyte-derived bioactive substances. Ann NY Acad Sci 892 (1999): 146-154. Kershaw EE, Flier JS. Adipose tissue as an endocrine organ. J Clin Endocrinol Metab 89 (2004): 2548-2556. Fain JN, Madan AK, Hiler ML, et al. Comparison of the release of adipokines by adipose tissue, adipose tissue matrix, and adipocytes from visceral and subcutaneous abdominal adipose tissues of obese humans. Endocrinology 145 (2004): 2273-2282. Chung TD, Yu JJ, Spiotto MT, et al. Characterization of the role of IL-6 in the progression of prostate cancer. Prostate 38 (1999): 199-120. Silha JV, Krsek M, Skrha JV, et al. Plasma resistin, adiponectin and leptin levels in lean and obese subjects: correlations with insulin resistance. Eur J Endocrinol 149 (2003): 331. Freedland SJ, Platz EA. Obesity and prostate cancer: making sense out of apparently conflicting data. Epidemiol Rev 29 (2007): 88-97. Stattin P, Soderberg S, Hallmans G, et al. Leptin is associated with increase prostate cancer risk: A nested case-referent study. J Clin Endocrinol Metab 86 (2001): 1341-1345. Somasundar P, Frankenberry KA, Skinner H, et al. Prostate cancer cell proliferation is influenced by leptin. J Surg Res 118 (2004): 71-82. Onuma M, Bub JD, Rummel TD, et al. Prostate cancer celladipocyte interaction: leptin mediates androgen-independent prostate cancer cell proliferation through c-Jun NH2-terminal kinase. J Biol Chem 278 (2003): 42660-42667. Saglam D, Aydur E, Yilmaz I, et al. Leptin influences cellurar differentiation and progression in prostate cancer. J Urol 169 (2003): 1308-1311. Campbell SC. Advances in angiogenesis research: relevance to urological oncology. J Urol 158 (1997): 1663-1674. Choy M, Rafii S. Role of angiogenesis in the progression and treatment of prostate cancer. Cancer Invest 19 (2001): 181-191. Sokoloff M, Chung L. Targeting angiogenic pathways involving tumor-stromal interaction to treat advanced human prostate cancer. Cancer Metastasis Rev 17 (1999): 307-315. Prior BM, Yang HT, Terjung RL. What makes vessels grow with exercise training?. Journal of Applied Physiology. 97 (2004): 1119-1128. A Ferrer, Fernando, J Miller, et al. Angiogenesis and Prostate Cancer: In vivo and In vitro Expression of Angiogenesis Factors by Prostate Cancer Cells. Urology 51 (1998): 161-167. Citation: Shrestha Sukriti, Zhao Xinxiang. Periprostatic Adipose Tissue Mapping as a Diagnostic Predictor of Prostate Carcinoma. Journal of Radiology and Clinical Imaging 1 (2018): 001-012.